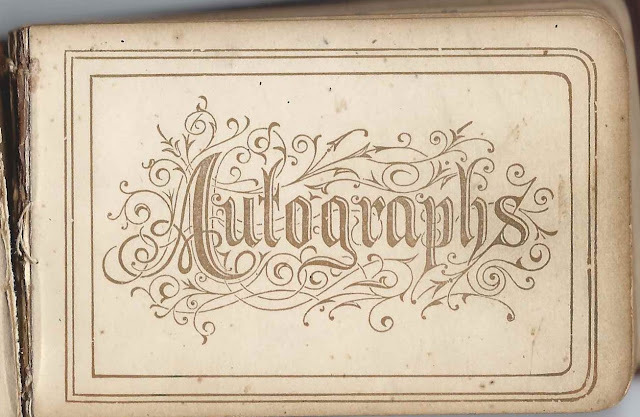 1880s autograph album that belonged to Minnie M. Beard, a student at Otterbein University at Westerville, Ohio. 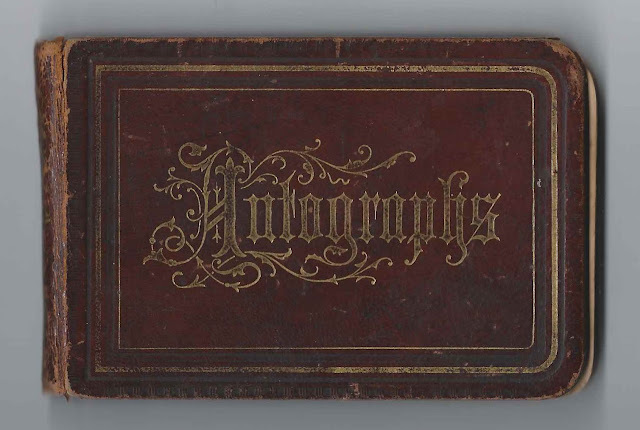 As if this album wasn't interesting enough, it's even more interesting because Minnie penned notes about the signers. One such page was that signed by William C. Wickham, who was the president of the Class of 1883 at Otterbein University. Sadly, Minnie noted that he was one of the over 2200 victims of the Johnstown Flood of May 31, 1889 in Pennsylvania. 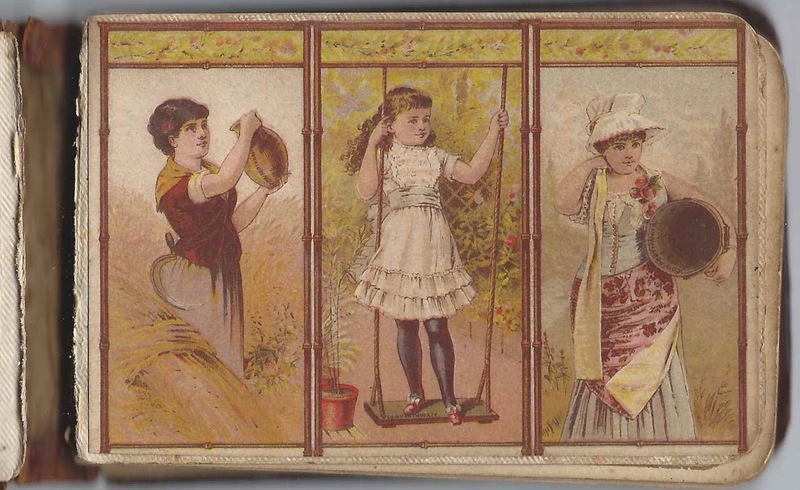 The album is approximately 4-1/4" x 3" and contains the sentiments of nearly 80 of Minnie's relatives, friends and schoolmates. An alphabetical list of the signers appears at the end of this post. Minnie's 1942 obituary in the St. Petersburg Times of St. Petersburg, Florida, indicates that she was a graduate of Otterbein University Conservatory of Music and that she died at the home of her brother, Alvin G. Beard. 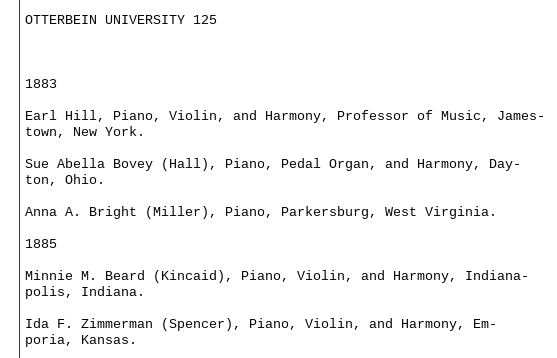 I had searched for Minnie Kincaid because a 1901 Otterbein University publication mentioned her as an 1885 graduate of the Conservatory of Music there and that her surname was then Kincaid. Assuming Minnie was the full sister of Alvin Glossbrenner Beard, her parents were Jacob Beard, Jr., and Permelia (Gaskill) Beard. Minnie was born about February 1866; several online trees list children only up to Laura, born about 1864. On 29 April 1896 at Hendricks, Indiana, Minnie M. Beard married bookkeeper Wendell T. Kincaid, son of Thomas and Sarah Kincaid of Dayton, Ohio. Minnie and Wendell lived at Indianapolis, Indiana; Charleston, West Virginia and, finally, St. Petersburg, Florida. They raised at least four children. If you have corrections and/or additions to the information above, or information on any of the signers mentioned below, please leave a comment or contact me directly. Two people in the album indicated a cousin relationship with Minnie. 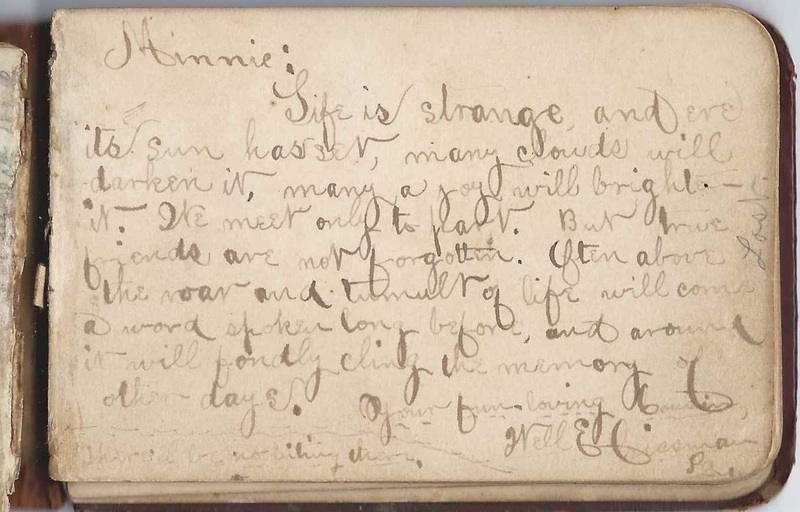 One was Maimee C. Shunk [not sure of given name or surname], who signed a page on June 21, 1882. The other cousin was possibly Nell E. Crissman or Well E. Crissman, or perhaps Crissman was not a surname but rather a town in Pennsylvania. If you can clear up this confusion, please leave a comment. S. J. S., signed at Otterbein University on November 14, 1884 "Remember the eve you wrote that letter to Miss ? Philips of Ashley, Ohio"
J. A. J. of Grover, Ohio, or Groves, Ohio. Minnie's later note: "Married"
Fred, signed on February 26, 1882. Minnie's later note: "Married"
Signed on January 21, 1883 by Spiro Spero [?]. Page is written in code. 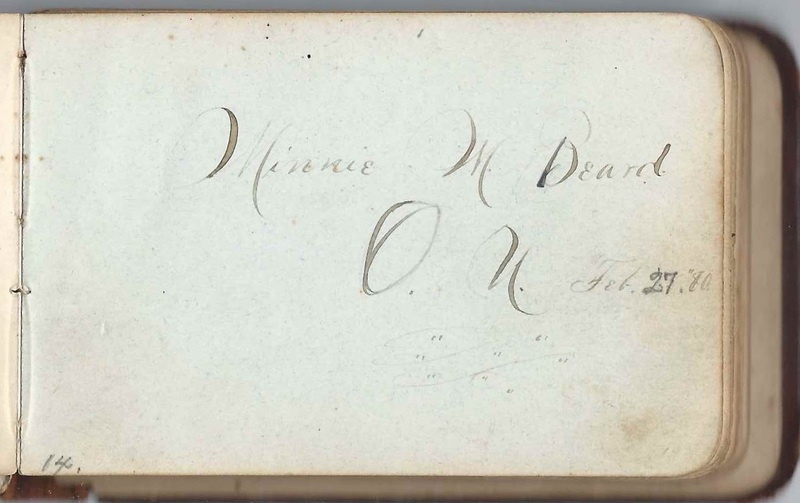 Minnie's later note: "Married"
Lel F. [part of the first name is erased], signed at Westerville, Ohio, on June 6, 1883. Minnie's later note: "Dead"
Hettie, signed at Ashley, Ohio. Minnie's later note: "Married"
Anna M. P. Minnie's later note: "Married"
Minnie's cousin, but I can't quite decipher the name and place. It looks like "Nell E. Crissman, Pa", but I don't know if Crissman is a surname or a placename, and "Nell" could be "Well". R. W. P. of Westerville, Ohio, signed on February 25, 1883; "Neighbor Boy"
Maude M. Dwyer, signed on December 18, 1882 at Otterbein University. Minnie's later note: "Died June 29, 1886"
W. R. Funk of West Newton, Pennsylvania. Minnie's later note: "Married"
Mary Gardner, Class of 1881 at Otterbein University. Minnie's later note: "Married"
May Harbert, signed at Ashley, Ohio, on June 22, 1882. 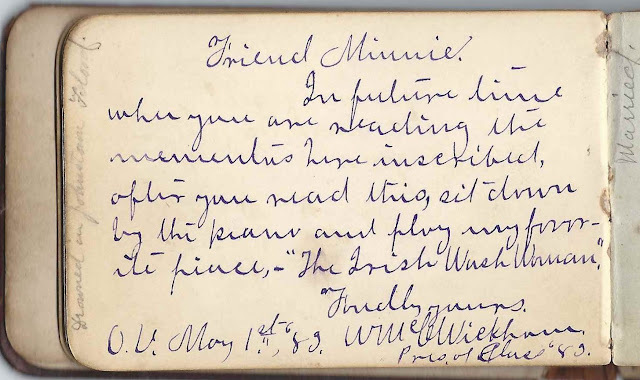 Minnie's later note: "Married"
E. H. Hill, signed at Otterbein University, on April 5, 1881. Minnie's later note: "Dead"
B. T. Jinkins; presumably Byram Thomas Jinkins, who attended Otterbein University. Minnie's later note: "Married"
C. S. Judy, signed on April 30, 1880. Minnie's later note: "Married"
L. H. Keister, signed at Germantown, Ohio, on May 2, 1880; "your classmate"
Frank A. Z. Kumler, signed at Westerville, Ohio, on March 1, 1880. Minnie's later note: "Married"
Justina A. Lorenz, signed at Otterbein University on April 13, 1880. Minnie's later note: "Married"
Ida M. Markley of Cherry Grove, Ohio. Minnie's later note: "Married March 20, 1883. Died July 24, 1883"
O. L. Markley of Sweet Wine, Ohio, signed at Otterbein University on April 10, 1880. Minnie's later note: "Married"
Alfred Pickford, signed at Ashley, Ohio, on March 13, 1882; A.H.S. C. N. Queen, signed at Otterbein University, on March 18, 1880. Minnie's later note: "Married"
W. C. Reese, signed at Westerville, Ohio. 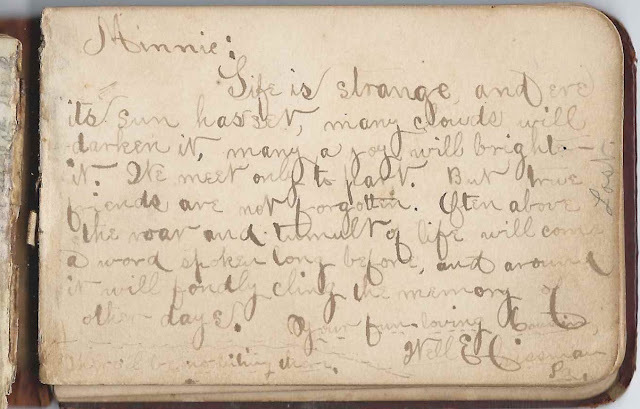 Minnie's later note in ink: "Married" and a further note in pencil: "Dead"
A. M. Rogers of Columbus, Ohio, signed on March 3, 1880; Minnie's later note: "Married"
Bertha A. Scott, signed at Otterbein University on April 24, 1880. Minnie's later note: "Married"
Imogene J. Shunk, signed at Cardington, Ohio, on October 26, 1881. Minnie's later note: "Married"
J. P. Sinclair, Class of 1885, presumably at Otterbein University. Minnie's later note, written in two places: "Married"
Harry Slusser of Louisville, Ohio, signed at Otterbein University on December 17, 1880. Minnie's later note: "Married"
Rev. J. F. Smith of Circleville, Ohio, signed on March 7, 1881. "Class of 1879". 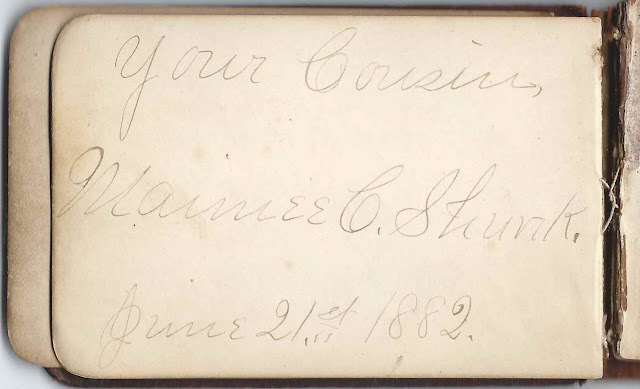 Minnie's later note: "Married"
Henry Stauffer of Sterling, Kansas, signed at Otterbein University, on April 26, 1880. 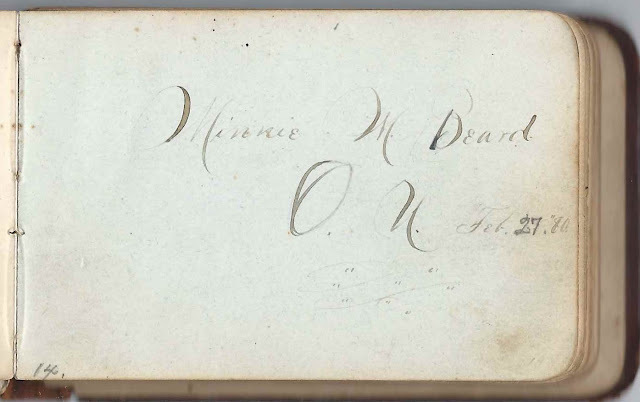 Minnie's later note: "Married"
Mrs. M. E. Weller of Westerville, Ohio, signed on March 16, 1881. Minnie's later note: "Died September 20, 1881". From Find-a-Grave. She was Mary Elizabeth (Pletcher) Weller, born 7 November 1844 in Ohio, daughter of Andrew and Rachael (Thomas) Pletcher and wife of Joseph Augustus Weller.
? Wilkinson; ornate initials; possibly P. F. Wilkinson. Minnie's later note: "Married"
James M. Wolff of Navarre, Ohio, signed on "9/12/1881. Minnie's later note: "Died October 20, 1881"
Charles E. Wyatt, signed at Ashley, Ohio. Minnie's later note: "Married"
I didn't find William C. Wickham on the list of the casualties in David McCollough's book The Johnstown Flood. It has the most complete list I have found, including the passengers on a train which was in Johnstown at the time. But he might have been among the casualties anyway. There were a lot of people unaccounted for so I'm sure there were a lot of unknowns as well. That wonderful horse saved your family! Perhaps Minnie heard the circumstances of William's death wrong - or perhaps he died some time afterward from injury or stress. Thanks for checking the list.